Tossing a slip leash over their heads and taking them for a walk wasn't very difficult. The danger was usually in taking them back. I had to reach towards their faces to remove the slip leash - which put me in danger of receiving a bite on the hand. So once I had these dogs out on leash, we'd walk...and walk.. and walk.. until both of us were quite tired. My thought process was that by the time we'd get back to their kennel, they'd be too tired to bite me (plus it gave me some time to work up my nerve to attempt to remove the slip leash). I don't know if my strategy made any sense or if it actually worked. But I can say that I never received a bite from a dog after I had walked him/her for 75 minutes. Maybe they weren't going to bite me anyway, I don't know. I did get bitten a couple of times during my 8 year stint as a volunteer but none of the incidents happened after a long walk. But even if my strategy did work, all it did was provide me with a short window of safety. I was doing nothing to address the biting issue. A 75 minute walk was usually enough to get a dog tired, but if I had continued that, the dogs would have eventually got conditioned. Then they would have needed a 90 minute walk, then a 2 hour walk and so on. And what happens if the human can't walk for 2 hours, or if it's to hot to walk that far, of if the dog has an injury that prevents long walks? Then we'd just have a biting dog who was in really great shape. In addition to moderate exercise, we should have employed stress reduction, mental stimulation, enrichment, and counter conditioning and desensitization. The same philosophy applies to pet dogs who are lucky enough to live in homes instead of a shelter. If a dog jumps all over company, we could take our dog on a 2 hour walk before company comes so he'll be too tired to jump, or we could teach the dog how to be calm when company arrives. If our dog always gets into the trash whenever we leave for work, we could take her for a 5 mile jog before work or we could put the trash out of reach or empty the trash before we leave for work. If our dog chews on the windowsill while we are gone, we could play fetch for 3 hours before leaving or we could use separation anxiety protocols to help our dog feel more comfortable about being left alone. Thanks for the compliment @I Love. and thanks for participating in pet therapy. 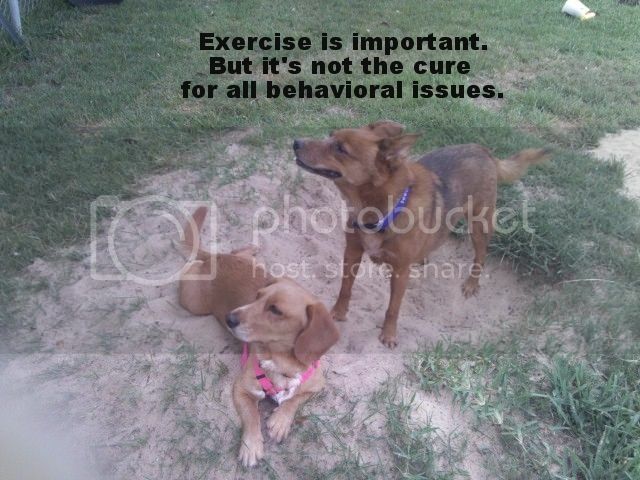 Have you tried taking your pup on therapy visits without exercise to see what happens? Maybe a dry run - where you go to visit friends or something to see how he does. Or maybe some hard exercise then an hour of rest, then on to the therapy visits? Or maybe a training session instead of a physical exercise session? Or maybe a relaxation session instead of an exercise session. Stay tuned. We will be talking about exercise in future posts. These are great suggestions - thank you.